Teknion Corporation today announced the introduction of Tek Vue ? its latest architectural interiors product offering. ?We designed Tek Vue in response to our customers? requirements that increasingly emphasize aesthetics, simplicity and value. Our new glass office-front system responds to these essential needs of today?s workplace,? said Mike Laudeman, VP, Architectural Interiors. ?Tek Vue focuses on single-center glazing and thin-profile frames, while providing effortless integration with conventional building construction and existing Teknion wall programs. Tek Vue wall and door programs are built on the concept of a universal platform, which re-envisions how a system can be specified, planned and installed within the evolving and fast-paced world of interior architecture and construction.? Tek Vue is positioned to provide a unique blend of attributes found in demountable partitions and conventional glazing systems. Horizontal profiles are only 1 3/8 inches thick x 2 1/2 inches high, and house single-centered 10mm or 12mm laminated or tempered glass. These frame profiles, as well as wall starts, door frames and transitions, provide independent building site accommodation and integration with conventional construction. 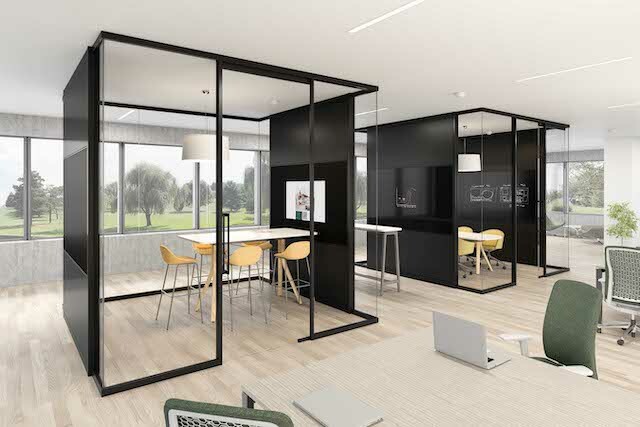 As well, Tek Vue is designed to integrate with Teknion?s Altos and Focus wall programs, leveraging their existing functionality to create more comprehensive workspaces.